Olympiakos may have to play two games behind closed doors. ATHENS, Greece -- Olympiakos are planning an appeal after the Greek champions were docked three points by a court on Monday and ordered to play two home league games behind closed doors following fan violence at a recent match. The court also announced the club would be fined €90,000. None of the punishments will be immediately implemented, pending the appeal. 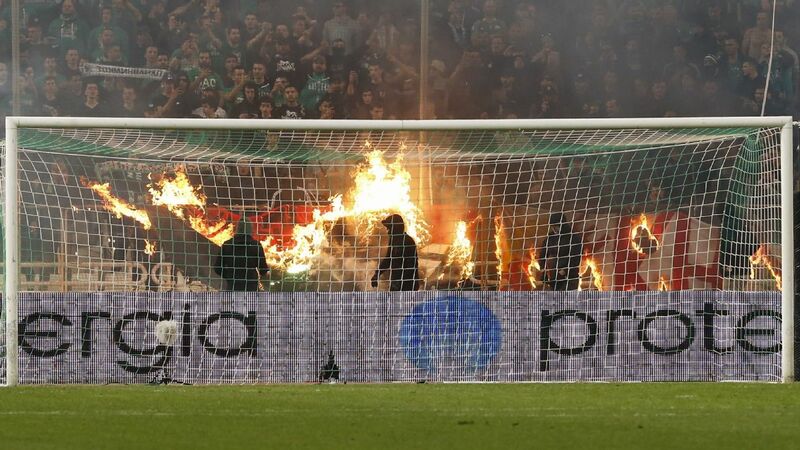 On Feb. 4, several dozen supporters -- some holding flares and pieces of wood -- ran on to the pitch and clashed with riot police at Olympiakos' Karaiskakis stadium after rival AEK Athens scored two late goals to secure a 2-1 victory. Olympiakos have dominated the league for two decades but are third in the standings this season with 43 points, which could drop to 40. AEK have 47 points and PAOK are on 46.